The Prospector is the most celebrated canoe in literature, and I have my eye on a blue beauty for sale online. For the past few months I’ve been reading everything I can about canoes. Recently, my search has become more urgent: I turn 40 in a month. I used to be adventurous, always hiking, camping and enjoying nature. Now I work in an office tower, and in my rare free time I write. Both are sedentary and rather solitary pastimes. I crave movement. In my mind, a canoe is a transcendental vessel offering the desired mix of tranquillity and adventure. In my youth, I went to summer camps on some beautifully named lakes and rivers in Saskatchewan: Last Mountain, Qu’Appelle, Katepwa. At camp, we would paddle canoes nearly every day. One summer, when I was about 10, we did an overnight trip five kilometres down the lake. 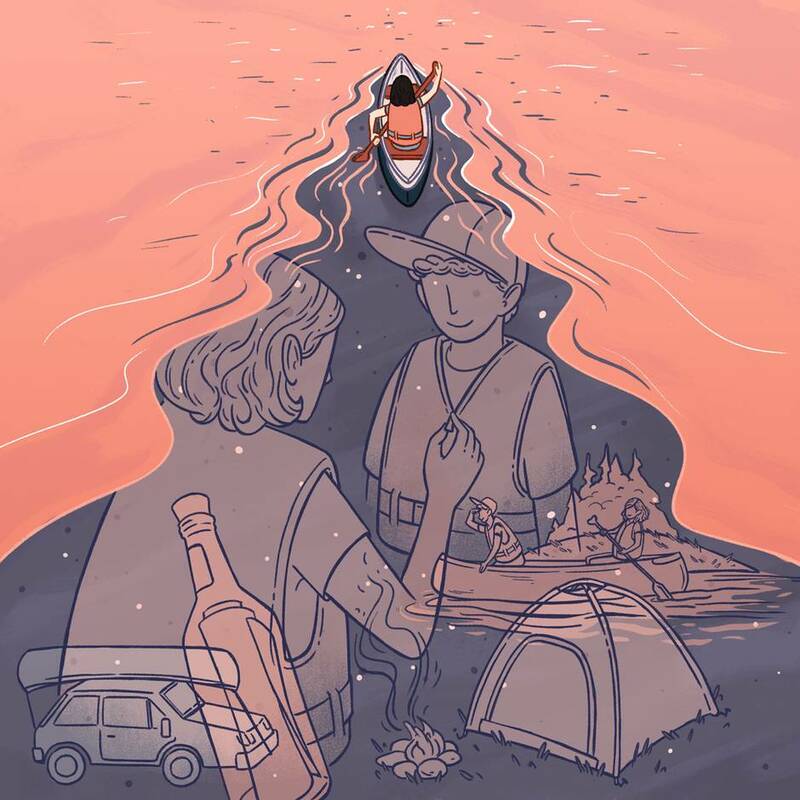 It seems extraordinary to me now that my eldest son, at 8 1/2, is almost of age to paddle five kilometres, set up a tent with fellow campers and sleep in the woods. Did I mention he is still learning to swim and is afraid of the neighbourhood rabbits? As our convoy paddled back, one of our beloved senior guides said, “You know, it’s impossible to sink a canoe.” To a handful of us, this was a dare. Oh, how we swamped that banged-up aluminum canoe. But our guide took it as an opportunity to show us a canoe-over-canoe rescue. To our complete amazement, as we bobbed alongside in our lifejackets, she and another guide overturned the swamped canoe and gradually pulled it perpendicular across the gunwales of their floating canoe, draining out the water. And then there was that time, maybe in first year university, when I went canoeing with an old friend north of La Ronge, Sask. Who knows where the idea came from, but there we were at midnight, strapping down Steve’s green hunk of a canoe on the roof of my tiny Nissan Micra with whatever scraps of foam and rope we could find in his parents’ garage. The canoe had been rotting away in the tall grass in his backyard, forgotten for years. When inspiration struck, it was there for us. Just knowing you have an old canoe in your backyard is magic. We drove through the night and arrived at dawn. We stood at the water’s edge without a single other person in sight. Our oars dipped into the glassy surface – and we were away. Steve was a powerful bowman up front while I sculled and J-stroked with ease. We were on a quest to find a buried beer bottle with a message inside. Steve and his father had buried it years before and made a map so they could retrieve it one day. That was before his parents split and his dad left town. And the map? Who needs a map when Steve’s memory of the excursion was crystal clear? I had no idea where we were going and simply steered according to Steve’s enthusiasm. “Over there, that one,” he’d say occasionally, pointing at a distant rocky island. He didn’t have a clue. That was fine by me. I didn’t mind if we careened from shore to shore all weekend long. The weather was magnificent: clear, cold nights and blazing hot days. Although I didn’t have a missing dad, I wished I had a missing map and a bottle of memories to find. Now, should I buy the gorgeous blue Chestnut Prospector that evokes Thoreau and his epic canoe trip into the woods of Maine? Canoeing builds a journey story; a picturesque passage through canyons, rounding the bend as if turning a page in a book. I can see myself pulling in among the reeds and writing all afternoon. This is certainly the romantic canoe of my dreams. Or will cedar be too heavy and too high-maintenance, with the sanding and lacquering it will require? Even if it doesn’t get used, it would look lovely on display in my backyard rock garden. No, I need to be practical about this. The Nova Craft Prospector 16-foot fibreglass/aluminum model from Mountain Equipment Co-op is described as the go-to canoe for tripping and family paddling. Compact and responsive, it can transition between lakes and rivers. This could be the one. As my 40th approaches and I shop for canoes, it seems that I’m actually shopping for future memories. I want my kids to know how to overcome obstacles – to steer their way through, or portage around if they must. I want them to experience the beauty of being alone in the middle of a lake, open to an enormous pink sky and the echoing call of loons. Although I haven’t canoed in nearly 20 years, it lives within me in a place associated with confidence, self-reliance and freedom. I want my children to see for themselves. And to see me anew at 40 years old. Life may swamp me, but it can’t sink me. Yes, I think I’ll go with the practical family Prospector canoe, the all-purpose memory maker, and see where it takes us. Rachelle Pinnow lives in Calgary. An earlier version of this article incorrectly said Henry David Thoreau was known to paddle a Chestnut canoe. In fact, it was a Prospector canoe.